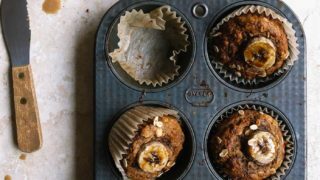 Small batch vegan banana muffins for breakfast, snack, and dessert! 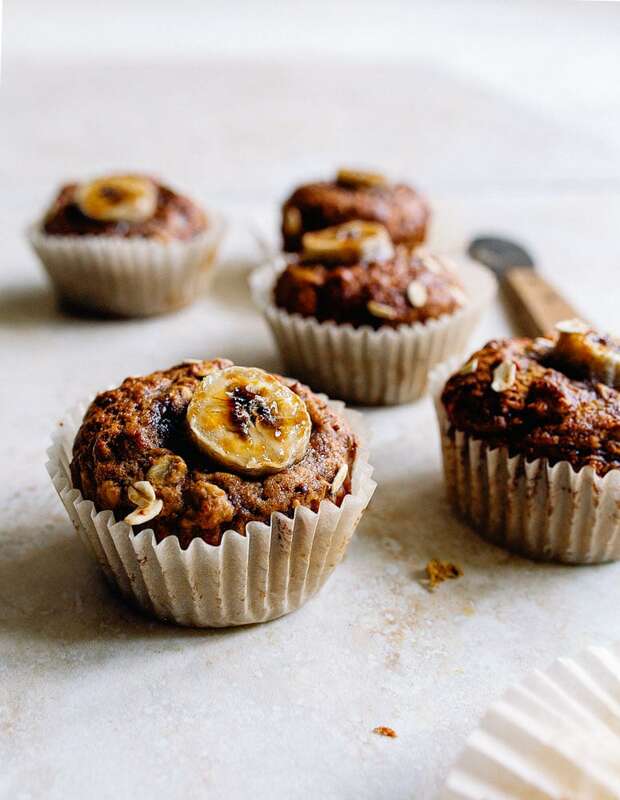 These small batch vegan banana muffins are vegan simply because I’m on a quest to cram our diets with as much flax seed as humanly possible lately. Plus, as you can imagine, I go through a lot of eggs in this house, and I frequently start baking before I realize I’m out of eggs. My giant bag of flaxseed meal in the freezer always saves the day! Did you guys know you can mix 1 tablespoon of flaxseed meal with a few tablespoons of water, and you’ll get a mixture that you can use like an egg in most baked goods? It’s perfect if you’re vegan, it’s perfect if you just want some extra omega 3s in your diet (cuz flax seed is packed with it!). I also crammed these muffins with oats and whole wheat flour, and sweetened them with coconut sugar. I’m going to file them under my Baby Food category, but if you make them for your adult self, please, lead that parade. Right before sliding these into the oven, I sprinkled the tops with a few extra pinches of coconut sugar. It’s why the bananas on top look like they just got back from a week at the beach. And they’re my favorite part! 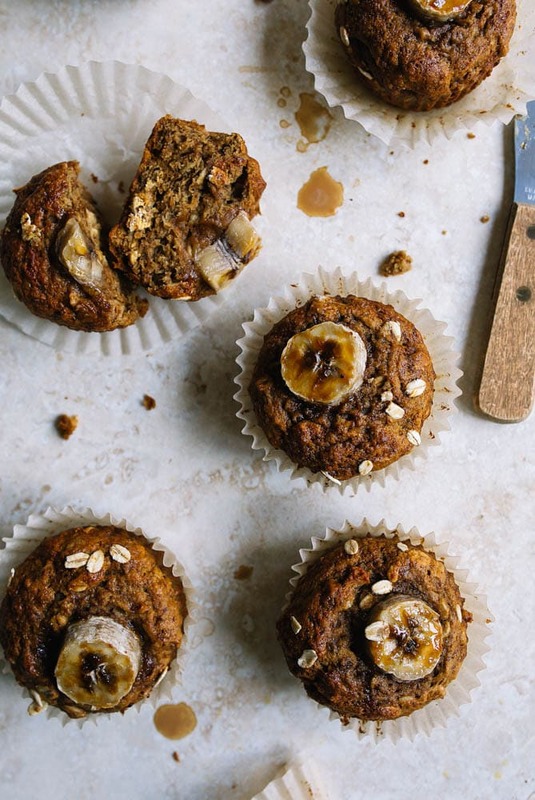 My Camille plucks the banana slices off the top of these muffins first, too. I should also mention that this recipe is made in just one bowl (like I would really pull out more than one bowl for a breakfast item, though–hah!) I had fun making these with Camille, because she thought mashing the banana was the best part! The recipe makes just 6 muffins, but you can easily double it. I adapted the recipe from Dana, and you should definitely check out her crumb-topped version! First, reserve 6 slices of the banana for the topping. Then, In a medium bowl, mash the remaining banana very well--mash until it looks liquid-y and resembles baby food. Next, stir in the flaxseed meal & water mixture, followed by 5 tablespoons of the coconut sugar, coconut oil, and vanilla. Sprinkle the whole wheat flour, regular flour, baking soda, salt and oats on top. Mix very well. Divide the muffin mixture between all 6 cups. 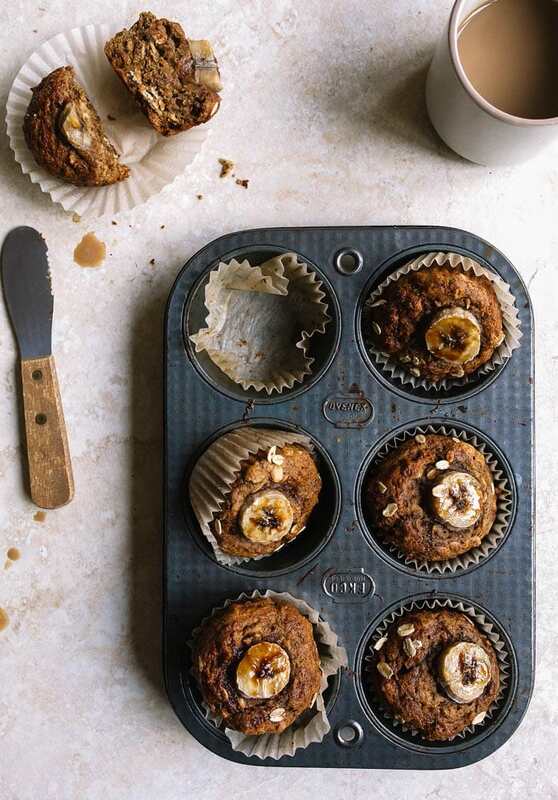 Add a banana slice on top of each muffin, and sprinkle the remaining tablespoon of coconut sugar on top. Serve warm. Store any leftovers tightly covered on the counter for up to 1 day. Hi! These were great! I substituted in 4 tablespoons of raw honey for the coconut sugar and added streusel topping and the texture was perfect! Hi, These look wonderful! I don’t have any flaxseed handy, can I sub an egg instead? Also, is frozen banana fine or does it need to be fresh? Hi,I really wanted to make these for my grandpas bday which is tomorrow. I don’t have any flaxseed meal but could I use almond meal instead? Thanks! In this case, flax is used as an egg substitute, so almond flour won’t work here. You can use an actual egg though? My daughter and I just made these before her brothers came home from school and they are SO good!!! All the kids loved them! We doubled the recipe because we had 2 bananas to use up. Extras for breakfast or packed lunch! Thanks again for another great recipe Christina! !